Meals, gifts, travel, and more! Shop with Scrip and support St. John's! Scrip is fundraising using gift cards. They are the same gift cards you would normally purchase from a retailer at your local retail stores, and they work the same way. You'll find cards you can use at grocery stores, gas stations, restaurants, home improvement stores and at almost any business that accepts gift cards. 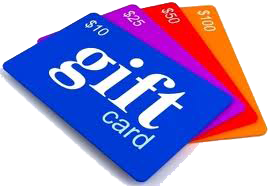 St. John the Evangelist Catholic Parish purchases gift cards at a discounted amount. Our school and parish families purchase these gift cards for the full face value and St. John's keeps the difference. Sounds great! How can I get started! Visiting the Welcome Desk before or after weekend Masses. Visiting the parish or school offices during the week. Using a King Soopers Reloadable Card. Make just an initial purchase of a $10 King Soopers gift card through the St. John's Scrip program. Reload additional funds on that gift card at the King Soopers store for any amount up to $500 and St. John's Parish receives a rebate check from King Soopers for 5% of every amount reloaded to that gift card. You do not have to have an account with Shop with Scrip to place special orders. If there is a gift card St. John's doesn't regularly carry, we may be able to special order it for you. Write your special order in the blank spaces on the Scrip form. Return the Scrip form after weekend Masses or to the Parish/School office during the week. Include payment. The card(s) will be special ordered for you. Delivery may take up to 2 weeks. After placing your on-line order, print a copy to submit with your payment and your order will be ready for pick-up within 10 days (your order will be available immediately if you request an eCard). Additionally, scrip is available to buy in the form of an eCard or eGift delivered to your email account through the ScripNow program. NEW: Sign up for PrestoPay to pay for scrip, eCard, eGift or to reload a gift card using your bank debit card ($.15 fee charged for each order and additional fees may apply, read terms and conditions on the Shop with Scrip website). Don't hesitate to ask us any questions not addressed here. How safe are scrip/gift cards? Gift cards are the same as cash, so your identity is safeguarded with the use of a scrip/gift card. On the back of most gift cards is a toll free number to call to check your balance. You'll need to have the card number available. Some stores allow you to check balances on-line. You would need to register on that store's site and obtain a user ID and password to access your card balance online. Can gift cards be used to make online purchases? Yes, most merchants allow you to use a gift card to pay for your online purchases, just by entering the card number. Some of these merchants include Amazon.com, Barnes & Noble, Target, Land's End, Walmart, Staples. Are some of the gift cards good at more than one store or restaurant? Many of the scrip/gift cards are through national chains. That means that one gift card is valid at a multiple of different stores/restaurants and can be used anywhere in the country. So you can purchase a gift card and send it as a gift to someone in another state. Why can't I use a credit card to buy scrip? St. Johns as the merchant would have to pay a credit card fee on each transaction of up to 3%, practically eliminating any profit made through the scrip fundraising program. Who do I contact if I have a question about the scrip program? The St. Johns Scrip Coordinator is Keith Baugh and he may be contacted by email at sjescrip@saintjohns.net.